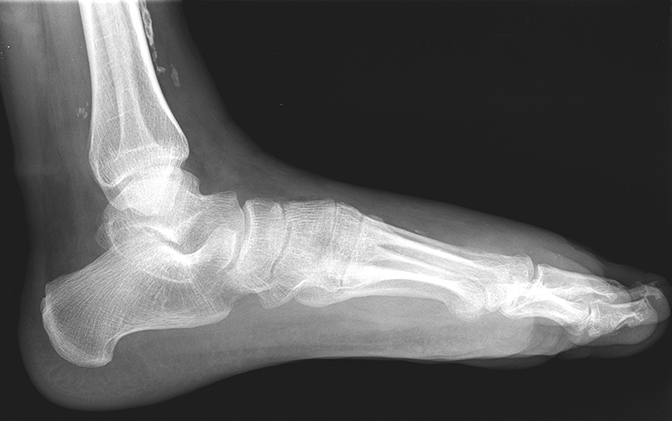 A 24-year-old male veteran presented with a 5-year history of a non-healing, painful left foot ulcer. Pertinent medical history related to the ulcer included osteomyelitis requiring antibiotics, multiple debridements, and skin grafting. His past surgical history was significant for a remote history of surgical intervention and endovascular treatment of an arteriovenous malformation (AVM) of the left lower extremity. 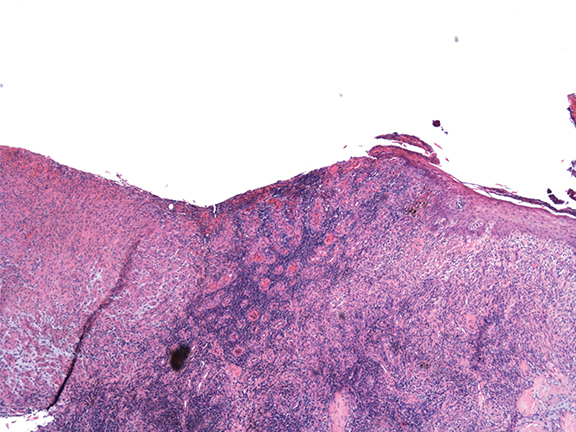 Prior pathology specimens from biopsy of the ulcer had revealed non-specific fibrogranulation tissue. Physical examination revealed a 6 × 2 × 0.2 cm ulcer on the dorsum of the left foot at the level of the second metatarsal head. The dorsalis pedis and posterior tibial pulses of the left foot were palpable. Transcutaneous oxygen measurements across the metatarsal heads and talus ranged from 39-49 mmHg. Due to his intractable pain and prolonged course of treatment for complications of his ulcer, the patient desired and subsequently underwent trans-metatarsal amputation for definitive treatment. 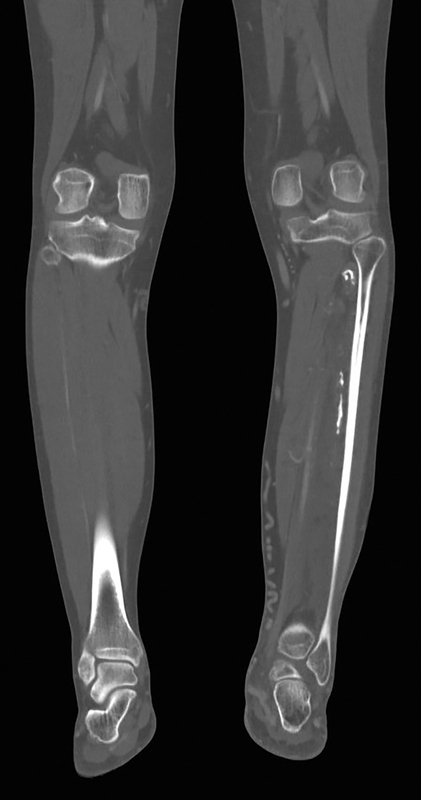 Radiographs show clustered vascular calcifications between the first and second metatarsals, ankylosis of the second distal interphalangeal joint, and chronic bony remodeling along the diaphysis of the second middle phalanx, compatible with a slow-growing, benign adjacent soft tissue process (Figure 1). 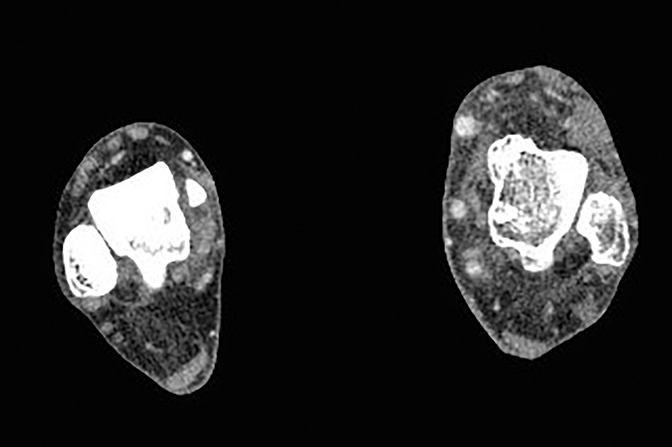 CT angiograms demonstrate occlusion of the left proximal-to-mid popliteal artery with one-vessel posterior tibial artery runoff and soft tissue thickening and fatty stranding in the left foot and ankle, as well as prominent vessels and extensive vascular calcifications (Figure 2). 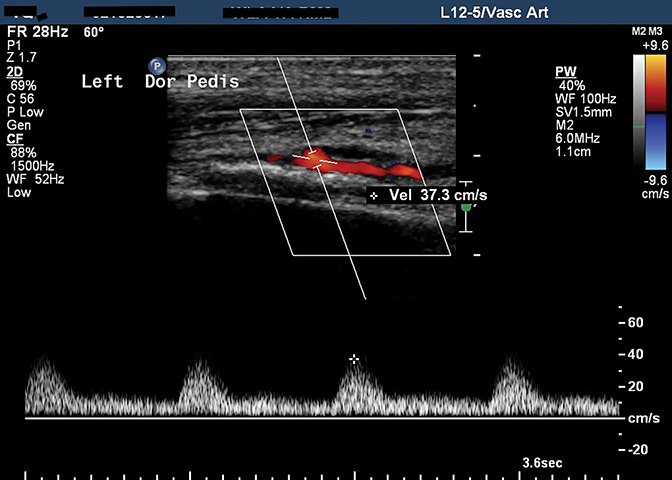 Ultrasound of the left foot shows loss of normal triphasic waveform and diminished amplitude of the dorsalis pedis artery waveform (Figure 3). Diagnosis of Stewart-Bluefarb syndrome is based on recognition of dermatologic findings in the setting of congenital AVM. Radiologic findings may be helpful in suggesting the diagnosis. 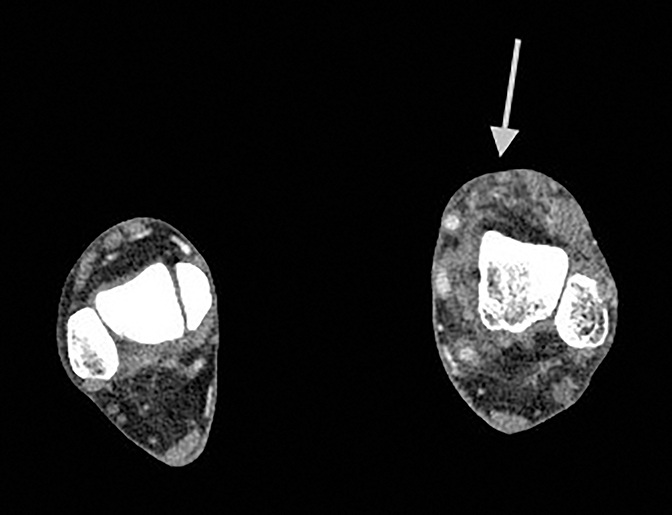 On plain film radiographs, vascular calcifications may be present. In the case of a large lesion, adjacent bony remodeling, as in this case, may be seen. Focused ultrasound of the vascular malformation may be limited depending size of the lesion, but Doppler interrogation may show high in-flow velocity of the feeding artery and/or arterialization of draining veins.5 Computed tomography (CT) angiography demonstrates vascular calcifications and delineates vascular anatomy. Magnetic resonance imaging (MRI) assists in characterizing flow pattern and anatomy, including assessing integrity of surrounding fascial planes and involvement of surrounding tissue.3,7 Digital subtraction angiography is the gold standard for real-time visualization of flow pattern and vessel morphology. Radionuclide quantification of shunting may also be of value.5 The differential diagnosis for soft tissue lesions with some or all of these imaging characteristics includes hemangioma, liposarcoma, synovial sarcoma, and malignant familial hyperplasia. The histopathologic features of Stewart-Bluefarb syndrome include angiogenesis with pericytes surrounding and invading vessels. The lesions may be differentiated from Kaposi sarcoma by the absence of “vascular slits” and CD34 expression seen in true Kaposi sarcoma.4,6 Hemosiderin deposition due to red blood cell extravasation into the dermis may be seen. 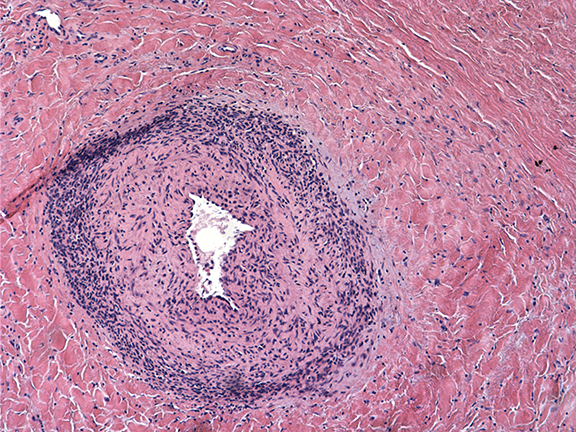 Pathological findings from the amputation specimen indicate endothelial cell proliferation and angiogenesis in a lobular pattern, with surrounding pericytes in the dermal layer, more than are normally present in this region (Figure 4). Amputation, as was performed in this case, should be considered a last resort option, as patients with large or multiple AVMs may have reduced wound healing owing to pericyte invasion into vessels and skin. Additionally, AVMs may extend beyond the region of skin findings – as demonstrated in our patient, which likely contributed to his poor wound healing. If amputation is a clinical consideration, detailed attention should be given to vascular imaging findings to ensure that a proposed amputation site is not within a region compromised by vascular malformation. Earlier attention to the possible diagnosis of Stewart-Bluefarb syndrome in this patient may have prompted stronger consideration of more conservative therapy. Acroangiodermatitis describes the disease spectrum of skin manifestations of underlying vascular pathology. Radiologists can aid in the diagnosis of patients with treatable lesions, especially regarding the recognition of underlying vascular malformations amenable to minimally invasive therapy. Bluefarb S, Adams LA. Arteriovenous malformation with angiodermatitis. Arch Derm. 1967;96:176. Yu GV, Brarebs RM, Vincent AM. Arteriovenous malformation of the foot: a case presentation. J Foot Ankle. 2004;43:252. Hueso L, Llombart B, Alfaro-Rubio A, Serra-Guillen C, Requena C, et al. Stewart-Bluefarb syndrome. Actas Dermosfiliogr. 2007;98:545. Dogan, S, Boztepe G, Karaduman A. Pseudo-Kaposi sarcoma: a challenging vascular phenomenon. Dermatol Online J. 2007;13:22. Rutherford RB. Noninvasive evaluation for congenital arteriovenous fistulas and malformations. Semin Vasc Surg. 2012;25:49. 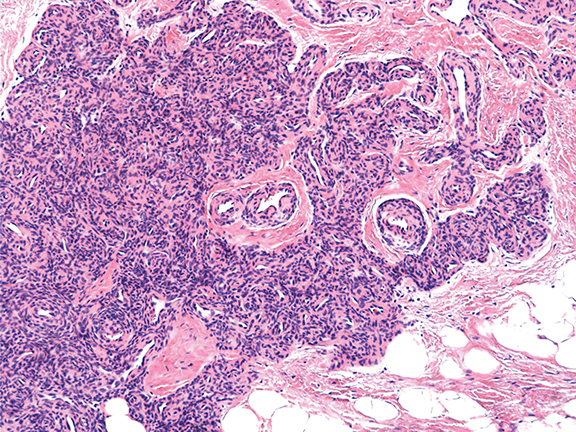 Agrawal S, Rizal A, Agrawal CS, Agrawal A. Pseudo-Kaposi’s sarcoma (Bluefarb-Stewart type). Int J Dermatol. 2005;44:136. Fayad L, Hazirolan T, Bluemke D, Mitchell S. Vascular malformations in the extremities: emphasis on MR imaging features that guide treatment options. Skeletal Radiol. 2006;35:964. Hayek S, Atiyeh B, Zgheib E. Stewart-Bluefarb syndrome: review of the literature and case report of chronic ulcer treatment with heparin sulfate. Int Wound J. 2013; doi: 10.1111/iwj.12074. Goda J, Kapoor R, Yadav BS, Sharma SC. 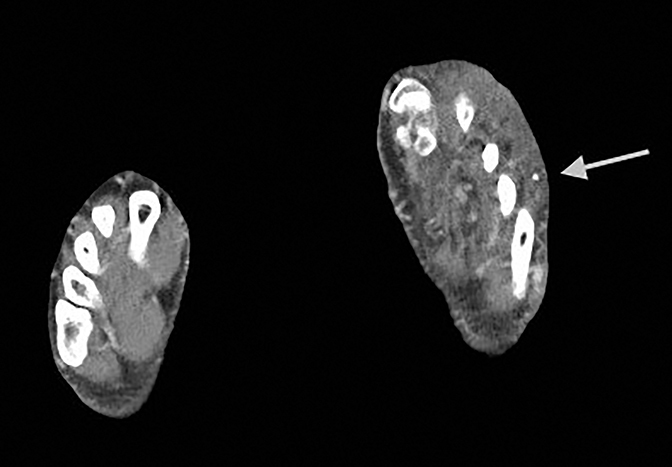 Radiation therapy for intractable bleeding in extremity arteriovenous malformation: considerations on a clinical case. J Med Imaging Radiat Oncol. 2009;53:331. Kurzbard-Roach N, Lewis, M, Chow K, Masih S, Modaressi S. Stewart-Bluefarb syndrome. Appl Radiol. 2016;45(5):42-45. Prepared by Dr. Kurzbard-Roach while in the Department of Radiology at David Geffen School of Medicine at UCLA, Dr. Lewis while in the Department of Pathology, Dr. Chow while a Radiologist in the Department of Radiology, Dr. Masih while a Radiologist, and Dr. Modaressi while a Radiologist at Greater Los Angeles Veterans Affairs Healthcare System, Los Angeles, CA.